The USDJPY is on the move today. The pair just cracked to a new session high and in the process took out the Jan 23 high price at 109.993. The high price just extended to 110.09 The 110.00 is a key level for traders. It is natural big figure level. It stalled the market in January. Breaking above keeps the bulls in control technically. On the run, the pair is trading at the highest level since December 31 when the price took out the December 26 low at 110.12. That is the next target followed by the 110.374 which is the September low (see daily chart below). Helping the bullish bias is bullish technicals. 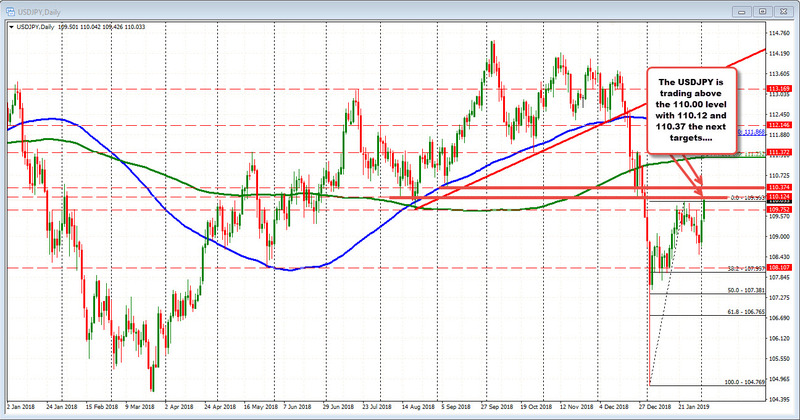 On Friday, the price moved raced higher and broke above the 200 hour MA (green line). That MA, stalled the correction but stalled ahead of a trend line on the hourly (see hourly chart above). Today, the 61.8% retracement held support. The trend line was broken. The 200 bar MA on the 4-hour was broken. The race was on.